So on monday I posted to my Facebook status.. "What are you good at"? and I didn't get very many inspirational answers. I was hoping to see "helping others", "leading people", "making a difference", etc. Instead, I got sleeping and cooking as top choices! I was initially inspired to pose this question, because I've realized that being an adult is so difficult because it is so isolating; especially living overseas! My family is far away, my friends' priorities are changing, and we're all splitting off to different paths and lives. When you're a kid, especially a student at my school, you're surrounded by so many adults who are rooting for you; who believe in you; who believe in your dreams and abilities. It's a lot of work to inspire others, and yet inspire/motivate/take care of yourself. As an adult, I don't know who is rooting for me. 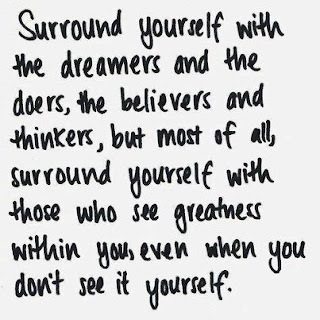 I don't know who to surround myself with. I'm discouraged to see that my friends (at least the ones through Facebook) still don't know how to answer the question, "What are you good at? ", despite so many years in school. I think this is an essential question that students should be able to answer by the time they are done with college, if not high school. But maybe I was phrasing the question incorrectly. Coincidentally, today at our faculty meeting, we watched a TED talks about teaching children to find their "spark". Maybe I should have asked, and will ask in the future.. what "spark" defines you? not what's your career, your religion, not your hobbies, etc. Rather, define the people in my life by their "spark" and make sure their "spark" aligns with my sparkle. I need to surround myself with people who nurtures the spark in my life. I need to constantly be aware of how my spark drives my daily living, in order to stay true to my beliefs, and pursue my own happiness. As I watched this video, I really felt tears of joy spring up, because dance is my spark. Dance lights the fire within my soul. Dance allows me to think in abstract ways, be confident, disciplined, patient, empathetic, flexible, and adaptable. I am especially grateful that I have been blessed with the opportunity to discover other cultures through dance, and have gained a better understanding of mankind through movement. I am grateful I discovered my spark at a very young age, and I won't take this gift in vain!